Still chugging along with it. I did shoot in a tournament this weekend with nothing but my 65lb setup, and other than the sweltering heat, faired pretty well with it. The few shots I made on the 2 rounds through that I didn't like were just release errors which can be sorted out. I have changed up a couple things though. First off, I've shot split finger and instinctive forever. I look at my spot, draw back, release, and by some divine intervention, my arrows seem to go where they are supposed to. With these heavier setups, I've had "control" trouble in that I can't keep super tight groups like I'm used to. So, out of the blue I thought I'd give 3under a go and it really seemed to help control issues, plus I was actually able to use the arrow as a reference and halfway aim. Since I typically won't take a shot past 20 yards on a critter, I can basically stick the end of the arrow at the bottom of the kill on an animal from 0 to 20 yards and I'm spot on. Even further out a little ways is not bad, but haven't really pressed the distance issue yet. Secondly, I've always shot a glove. Every time I ever tried a tab, I always slapped my face with it upon release. With gloves though, the only comfortable ones I've found/use are made of thinner material. I've got to be able to feel the bowstring, and thicker gloves never worked out well for me. I figured out quick though that heavier bows do not go good with thinner gloves for me...After about 30 shots, my "shooting finger" (my third finger) feels like its about to fall completely off and shooting isn't as comfortable. So, I figured since I've swapped to 3 under, I'd try a tab again. I dug around and couldn't find one so ended up making one to try. It felt waaay better than the thicker gloves and I had no pain at all on the shot. So, now I guess I'm a tab using, 3 under shooter. I told one of my shooting buddies the other day that I was coming out of the closet and going to be a 3 under shooter. I will say I got a lot of looks this weekend from folks who noticed I didn't have my shooting glove on or shooting split anymore! Supposed to have a shipment of arrows come in today or tomorrow and will hopefully have my setup 100% tied down in the next few days. 37 days and counting to take off! Last edited by MedicineMan7; 07-23-2018 at 12:36 PM. That's a lot of change just before a big hunt. If it works, do it. Keep us up to date. That's what I said to myself too!! 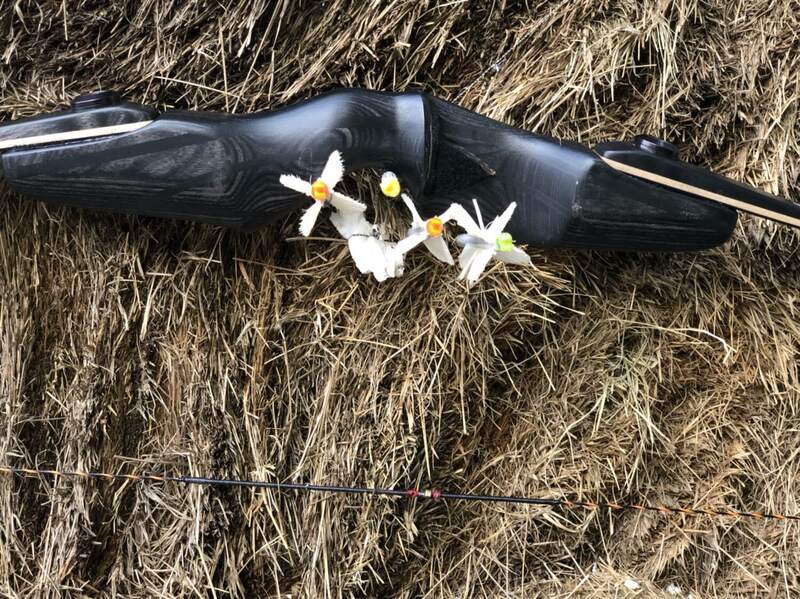 For some reason my hard-headed self that's usually very resistant to change has become overwhelmed with all the new arrows, points, tuning procedures, ect., ect.....These heavy bows have pulled something loose in my brain! Went to 3-under a year or two ago after always shooting split (because I saw a Rick Welch video and he advised it). Took no time to adjust -- I mean, like one or two practice sessions. Seemed to noticeably provide smoother releases -- as it logically should, since contact with the arrow nock has been reduced by half. On sighting down the arrow -- never hurts to remove a little mystery out of the process. Anyone that can shoot as well as you, Shiloh, will be even more deadly when you actually know where you're aiming. These heavy bows have pulled something loose in my brain! You have always had a few screws loose in your brain!!! My wife would prolly agree with ya! As i look at that rib one more time, i start to wonder if a 65ish pound bow with a 650-700 grain arrow wouldn't be just as effective. The reason i say that is i am not sure any bow is going to shoot through that rib and i figure, in meat, the 65#s and 700 grains would be plenty. Any thoughts? PS good luck on your hunt!! My first reaction would be that packing that light of a setup is conceding defeat, and you might as well save the plane fare...BUT, I do think that you have a point in that if you KNEW you were going to centerpunch a rib, at its thickest part, #9 probably isn't going to make a difference. Fortunately, since the rib structure is constantly going thick to slightly thinner, the optimist(and chasing a #2000 critter that can stomp you into you mud, you would have to be)is counting on the fact that there is more upside than down? I personally dont think #65 would get through the thinnest area of the ribs, nor would a PH take you out. In fact, they shoot head-on into the void between the shoulders...but that's a whole nother conversation! the other hunters that have take'n dangerous game, all say the same. experience in this, i'd listen to the men and women that have taken this game. Have no experience in anything like this but I definitely agree with this here. I’d hate to be in the brush with a wounded buffalo even surrounded by a PH and trackers with big double barrel rifles. I am not saying that a lighter bow is the way to go, I guess mainly I am not real sure any bow could shoot through that big old rib. Even with an 80+ # compound, I would have my doubts. Seems like it could really come down to shoot placement much more than a deer, elk, etc., cause it seems to me you really would have to split that gap. Last edited by RJH1; 07-27-2018 at 11:51 AM. From all the reading I've done, basically you are looking at a 95% chance that you are going to hit a rib bone going in if you take a broadside shot. Your chances of hitting a rib decrease if you either try and hug the shoulder with the front leg pulled forward, or if you try and shoot on the lower side of the kill, still in front of the crease. Both options increase odds of something going wrong because too low and you miss the vitals, or to far into the shoulder and you actually hit it, then you have a ticked off buff! The pic of the rib with the broadhead sticking out is actually Australian water buffalo, and the head is sticking in the interior portion of the rib after going through the other side (Buff may correct me on this, but that's how I took it when I've seen it before and now). I plan on shooting my current setup (906gr total: Easton FMJ Dangerous Game 250 with 50gr brass HIIT insert and 300gr Tuffhead) into a cinder block to see how it holds up per recommendations from a good buddy whose already got an awesome cape buffalo on his resume with trad gear. Just kind of an extra step to see that everything is strong enough to hold up. As he mentioned, if it stands up to a concrete cinder block, a buff rib will be toast! Thanks for the info, glad to hear that they can be shot through. Good luck and keep the updates coming! Who’s name is going on that arrow? When we hunted in Australia... Mark had a 70 something pound bow. Well, I broke out a practice head and Shot it into a cinderblock from about 10 or 12 yards and this was the result. I got about a half inch of penetration into the block and had to chisel it out. Head still 100% intact, and still spends good in the hand. Arrow was also 100% and did not even blow the nock out. The tip was just a tiny bit bent, but I’m not sure if that is from the actual hit or the process of getting it out of the block itself. It actually looks more bent then it is in the picture because it is a single bevel head. Overall pleased with the performance and feel like it will work on a buffalo rib. Cant believe the nock didn't blow out. I wish you would have videoed that shot, bet it was something. Impressive! Tuffhead earns its name. I was shocked the nock didn't blow out either. I actually had my phone set up to record it, but backed out last second afraid of what was going to happen (with my luck) and didn't want my new phone to take any hits of flying shrapnel! Definitely gets its name honestly! Yes sir, just hope they don't soak my arrow up like this cinder block did! So, when are you going bud? I cant wait to read the story and see ldp’s. Will be landing in 3 short weeks! Schedule is jam packed between now and then, so hoping it doesn't drag by too slow. Got my packing list started a couple days ago so hopefully won't be scrambling the night before (like I usually do) to get everything gathered up. Awesome! That's too cool, man! I wish you the best of luck. And I'll be around checking once in awhile to see if its already down...because it will. That would be pretty awesome, but my wallet says “no......” and my wife would say “NO!!!!!!!”. Noticed the last couple days that it seemed like I was getting a bit of up kick from my arrows out of my 76lb bow if my release wasn’t perfect, so I tied on another nock to go below the arrow nock and it seemed to alleviate the problem and all my arrows thereafter were flying like darts. I did throw in a bare shaft to see how it would hit with the rest of the arrows from 15 yards or so. I honestly saw zero wobble in it and it was arguably the best shot out of the four. Now this is awesome. Will be following. That cinder block shot was wicked. Going to be the hunt of a lifetime for sure. Cant wait to read about the adventure. Got a couple pics from a scouting trip/blind build a couple days ago. Every picture I’ve looked at of these animals makes my heart start to race and makes me even more ready to get there. I’ve told him from the beginning, I don’t have to have a 40”+ bull or whatever most would consider a trophy caliber animal. If that happens, so be it, but really want an old, solid, hard bossed bull really regardless of width. Irregardless of size, I’ve yet to see see a pic of one that looks like its happy it’s picture just got taken! They built a new blind with the base 6ft off the ground so a little bit of comfort level can be added in case they come our way! They should've used bigger or steel posts if you wanted some chance of refuge. from the book "Death in the Long Grass", Capstick says that Cape Buffalo look at you like you owe them money. This is so freakin' awesome. I read all of Capstick's books growing up, and buff is number one on my list over there. Can't wait to see more of this adventure. Wish you all the luck, a perfect arrow, and a short blood trail! They DO have a mean look, I'd like my blind to be a little more reinforced. He won’t have anything to worry about. Lammie will have a BIG rifle with him!!!! That is where my obsession with Africa stems from (along with seeing the place for the first time in person and being consumed by it ever since). First book I ever read from cover to cover was "Death in the Long Grass" and have always dreamed about chasing buffalo because of it. Not sure if being off the ground a few feet or being in a blind on the ground is better with them dang critters. And I truly hope the BIG gun don't have to be used.. I've read his books and they are awesome. The chapter on leopards was amazing! Getting closer and the PH is now "baiting" his hunter. I am ready to read the report while drooling over the LDP. Sitting here, I pulled up my flights to look over seat assignments and a few other details, and happened to see this. EXACTLY two weeks from now I will be lifting off on the first leg of this journey. This whole thing has literally been a dream in the making the last two years and here I sit on the fast downhill slide of things. It’s honestly hard to wrap my mind around what all has went into this one hunt. I’ve prepared for hunts before and read about and talked to many folks who’ve prepped for a big hunt, but going through it all myself has been an experience in itself and I’ve learned a lot along the way with the help of more folks than I could count on all my fingers and toes! In the last 7 months, I’ve went from shooting 47lbs to 76+ lbs comfortably on a daily basis, changed from split finger to 3 under, swapped from instinctive to gap shooting, and went from looking at the gym across the parking lot to being in the gym 4+ days a week. I’ve taken notes along the way on most all of it and flip through them to check back on things that has/hasn’t worked. I was looking at my workout notes today after I finished up and was shocked how far I’ve come in that alone, and have no doubt that it has been one of the most beneficial things I’ve done in this journey. It’s crazy how much a fella will put his body through in order to make it grow and do things it normally shouldn’t do (like shooting a dang 76lb longbow!). These last two weeks are fly by, or they are going to be slower than molasses dripping out of a bottle up at the North Pole outside in the middle of winter! Hope to see you smiling in a LDP to make it worth all the preparations. I got confidence in both Lammie and you, Shiloh! Good luck, and send me pics!! !